Tis the season to celebrate everything we love about being outdoors - music festivals, farmers markets, picnics in the park, neighborhood barbecues, and of course, summer vacation! The Compass & Key Summer Gift Guide includes inspired artwork, picnic essentials, and products that make the most of traveling this season. And all 12 gifts cost below $200. So whether it's for the host/hostess, or any of the numerous special occasions of summer - weddings, anniversaries, birthdays - look no further than the Compass & Key Summer Gift & Gear Guide. 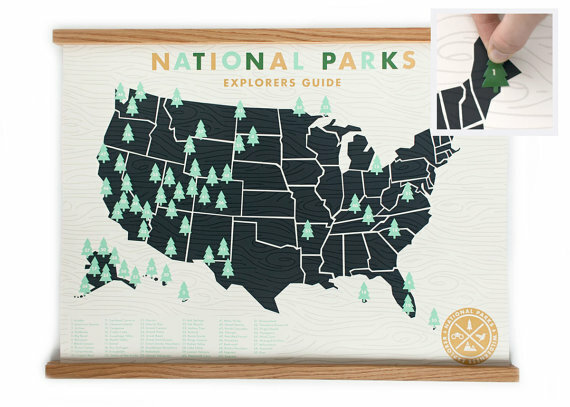 For anyone who is trying to reach all 59 of the U.S. National Parks, or simply loves these protected pieces of wilderness, help them showcase their achievements with this wall art from Ello There. They can commemorate each Park visit by placing the corresponding numbered sticker on the map. We are giddy every time we add a sticker to ours, which we proudly display surrounded by photos from our adventures. Available as a screen print or mounted on canvas. Perfect for newlyweds, this compact set comes with everything they need for spontaneous al fresco dining, even a tablecloth. They can throw it in the car, daypack, or checked luggage for a gourmet picnic wherever their adventures take them. We've owned our kit for several years and use it constantly, especially to enjoy our finds at the weekend farmer's market. For the professional picnic partier, check out this picnic backpack. No more worrying about broken glass during picnics in the park. This reusable wine carrier rolls, folds and flattens to be easily transported once you're done enjoying your favorite wine. This ingenious product comes from Vapur, who also created our favorite water bottle. We use our wine carrier whenever glass is frowned upon, from dining poolside to day hikes to movies in the park. The perfect gift for any book worm, these brilliant pieces of art are created using the words from classic and contemporary literature. If you look closely, this tote bag features 20,000 words from Henry David Thoreau's masterpiece, Walden. The designs are also available as t-shirts, posters, scarves, and even temporary tattoos. Litographs honor a range of authors, from Jane Austen to Kurt Vonnegut to Walt Whitman, and donate books to communities in need. For anyone who is embarking on an epic vacation this year and plans to capture their memories with a DSLR camera, help them carry it in style with this case from ONA. Offered in a variety of colors, the Bowery bag includes a padded interior for the camera and one extra lens, as well as handy pockets for a few accessories. Our Bowery has aged beautifully with time, and we bring it along to every destination we visit. Also featured in the Compass & Key Camera Travel Essentials list. Cords are now a part of our daily life, so help your gift recipient keep them organized with this sleek Italian leather organizer from This Is Ground. Useful for a variety of everyday objects, including headphones, camera cords, a pen/pencil/stylus, eyewear and more, the Bandito rolls up to easily transport in a briefcase, handbag, or carry-on. We're also fans of this set of cord tacos, which we use to keep things organized when we travel. Ladies know that makeup looks more natural and lasts longer when applied with quality brushes. A quick touch up is easy with this petite set of professional makeup brushes from beauty expert Jenny Patinkin, the perfect gift for the modern woman in your life. For more travel beauty tips, check out our interview with Jenny. Sure, a deck of cards is always a great gift, but why not help the recipient learn another language at the same time? Each card features commonly used phrases translated to French and Spanish. Some of our favorites: "Can you recommend a good restaurant?" or "Another one please." We bring our set wherever we go to brush up on our skills. Help your favorite chef savor the bounty of summer with this salt sampler from Jacobsen Salt Company in Portland, OR. This sampler comes with a wooden stand for counter display, perfect for the host or hostess at your next barbecue. We contend that books are always the best gift for kids, allowing them to use their imagination to travel to new worlds and far off places. Not only will this heirloom set of classics give them something to read on summer vacation, it will also be proudly showcased on their bookshelf for years to come. Juniper Books has created stunning decorative book sets like this one for kids and adults alike, including Harry Potter, Lord of the Rings, Game of Thrones, and much more. Speaking of books-as-gifts, this coffee table book from National Geographic will inspire newbie and seasoned travelers alike. We received our copy as a gift and reference it every time we're headed to a new country. To personalize the gift, place sticky notes on the pages that inspire you most with a handwritten note as to why. What gifts are you giving this summer? Share your ideas in the comments below.